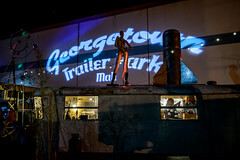 Georgetown Art Attack 10th Anniversary February 10! Fall in love all over again with the Georgetown Art Attack on its 10th anniversary! 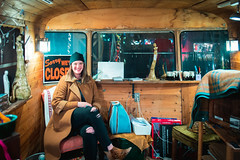 Make a date to visit the enchanting romantic Georgetown industrial arts district on Saturday, February 10. Jump aboard the FREE Art Ride to check out our west end locations such as studio e, and Equinox Studios! Fantagraphics Bookstore & Gallery presents TRUMP’S ABC, a show of original art by Ann Telnaes, the Pulitzer Prize-winning editorial cartoonist for the Washington Post. The exhibition opens on Saturday, February 10. The artist will appear to discuss her work and sign copies of her alphabet book for adults on Saturday, February 17 at 7:00 PM. All City Coffee Stay Sweet & Ride High! 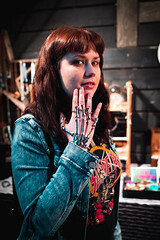 Woodcut wall hangings, ceramic pots, prints, and custom painted motorcycle helmets by Devi Ann Pellerin. This show is pure fun: Lowbrow, cartoons, 70’s illustration, vintage motorcycles and a good time! Interstitial Mind at Large, a site-specific installation by Seattle based artists Brandon Aleson,Benjamin Van Citters, and Reilly Donovan. The exhibition takes its name from Aldous Huxley’s The Doors of Perception, in which the author argues that certain experiences disable the filter of consciousness and enlarge perception. Through virtual reality and installation, Mind at Large explores the various modes of navigating the space between the digital and physical. Prairie Underground presents Everyday Possibilities of Feeling Like A Totally Different Personby Dakota Gearhart. A series of new videos incorporating collage, performance, and sound that take inspiration from popular makeup tutorial videos, but turn them into surrealist narratives of face shapeshifting. An ode to femme culture, as well as, a look into identity, gender, and costuming, the videos playful speak to the presentation of self and the many forms we can inhabit simultaneously. Illumination Studio # 305 presents Rostad, Dari Stolzoff and Ferrell. Rostad, explores the inner beauty of our neurological system through vibrant color and Ferrell explores spatial and color field through abstraction. Also Dari Stolzoffas abstract expression in in bright color and light. Music by “DJ” Luscious Leopard Lips, who brings background music with a Theremin synthesizer and keyboards. With new work up, you’ll be glad you came by. Machine House Brewery “Five Eyes”, a photo exhibition from Hiroyuki Nakada opens on Art Attack. In brash monochrome these photographs favor the eyes of its subjects, stubborn to capture a naked and lucid look from them. “…what I need now is to continue taking photographs. What else is there to do? By doing so, one day I will see into the human abyss.” -Hiroyuki Nakada. 32 photographs presented. 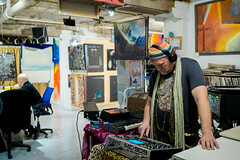 Machine House is also host to post-Art AttackSoul Night from 8pm to Midnight. This month’s Soul Night will be a special Silent Disco edition, with DJ Brownstone and Little H spinning vintage Soul, R&B and 70s/80s dance music. Come and check out our new art show and stay for the music till late! The Conservatory will be hosting Jewelry and Fashion Artists with pop-ups this February’s Art Attack. FIVE distinct artists showcasing their fashion accessory and jewelry creations, something for everyone you love. The Georgetown Music Store for your listening pleasure Acoustic Armageddon #43 featuring Don McGreevy, Noonmoon, and Jim Davis. Music begins at 6PM. Free – All ages welcome. studio e Join us at studio e gallery for the 21st Annual Neddy Artist Awards featuring work by: Gretchen Bennett, Marita Dingus, Dakota Gearhart, Christopher Jordan* – 2017 winner in painting, Tuan Nguyen, Che Sehyun* – 2017 winner in open media, Barbara Sternberger, GillianTheobald. Funded by the Behnke Foundation and stewarded by Cornish College of the Arts as a tribute to the Seattle painter Ned Behnke. Coral / Equinox Studios presents Orphan, Radio Relaunch Party. Radio focuses on local artists and DJs, highlighting the diverse music community here in Seattle, and national and international artists. It streams on www.orphanrecords.co.uk advert and promotion free. On February 10th, 2018, Orphan. Radio relocates to Georgetown, broadcasting out of Coral at Equinox Studios. The re-launch party features Vancouver’s Neo Image along with Kristen Dalen, Aos, US41, Raica & Orphan, and resident DJs.y.